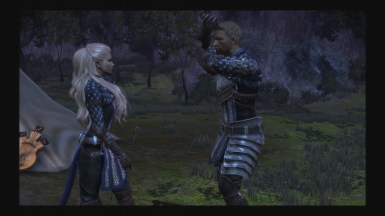 Adds a lighthearted cutscene to the Alistair Romance for female Wardens. 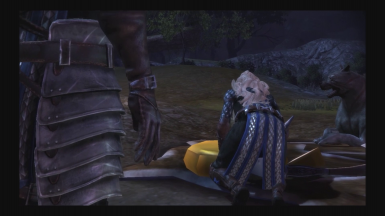 The lovely animation of Alistair shielding his face with his arms was created by Cheleck. This mod adds a cutscene for female Wardens, showing the "increased appetite" Grey Wardens experience after the Joining. To install, download the file, extract it and install the .dazip with your favourite mod manager or the DAUpdater. Once installed, the next time you're in the camp, the cheese wheel in front of the Warden's tent will invite you to "Have a snack", which triggers the cutscene. You can trigger the scene anytime while in an active romance with Alistair, but it makes most sense after the "What changes after the Joining" conversation, and after your first kiss. The scene is meant to be funny and lighthearted. If you are roleplaying a serious Warden or your Warden is conscious about ladylike etiquette, this scene might not be your cup of tea. The scene contains some body contact and close-ups so it will look best if you put your couple in light or medium armour and try to avoid shoulder plates for your Warden. The Mabari in the scene will be mapped to your own Mabari now. If you haven't recruited one, it won't appear. I removed the other people standing around in the camp - I don't think Alistair would start teasing the Warden about her eating habits in front of everyone. And a big thank you to all you lovely people who add your own images! Let me know if you experience any trouble getting the mod to work.